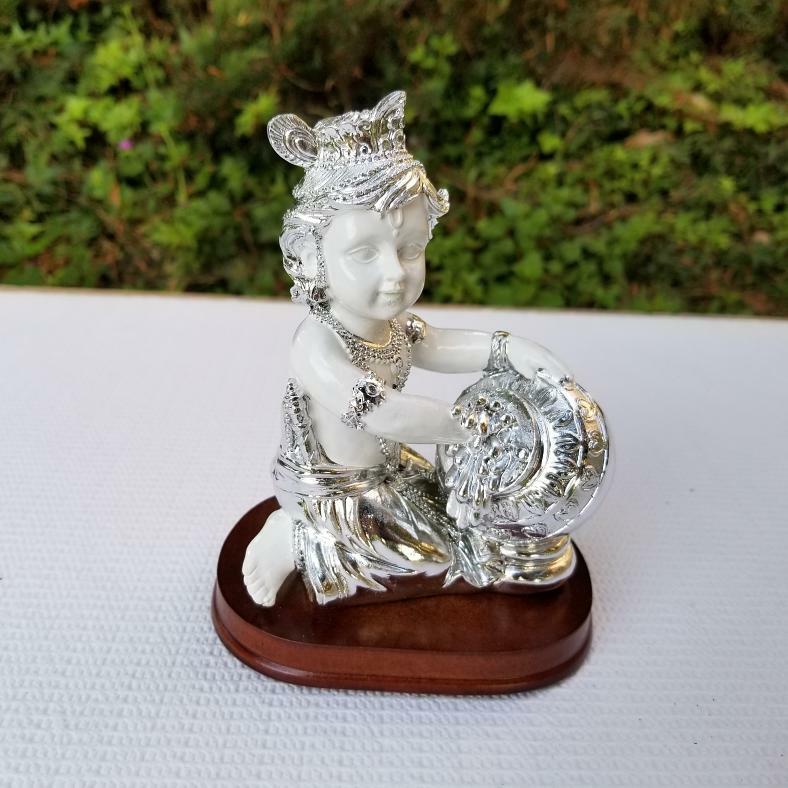 Kanha Baby Makhan Chor Murti w/ Silver Plating 6"
Appealing statue of Baby Krishna enjoying butter, silver plated over white marble like resin on a wooden base, truly realistic. *6 Inch eye catching statue, depicting Baby Krishna in the infamous "makhan chor" (Butter thief) pose. *Ideal for puja or meditation altar, or any prominent area of the home. * A spiritually vibrant gift for family or friends. *It is fragile, please manage with care. Lord Krishna is the favorite Hindu deity of all Indians and popular with other cultures too. as a child and He was always successful in averting the reprimands that came His way! This item in Religious Figurine & Sculptures category was first added to our catalog on 09-22-2017. Buy Kanha Baby Makhan Chor Murti w/ Silver Plating 6", sold & shipped by Fabulous India where you can shop online for Natural Holi Color Powder, Hair Oil, Henna Powder, Indigo & Vitamins. This Idols & Statues collection has been tagged as baby, krishna, statue, puja, festival, idols, krishna deity, hindu religion, janmashtmi idol. Divine Ganesh Murti w/ Incense Holder 7"